Kenneth Kellogg as Young Emile Griffith (center) and Arthur Woodley as Old Emile Griffith (right rear, on bed) and chorus in Opera Parallèle’s production of “Champion: An Opera in Jazz” at SFJAZZ. Photo Credit: Opera Parallèle. This is “Champion: an Opera in Jazz,” music by jazz trumpeter and composer Terence Blanchard, libretto by Michael Cristofer — a wrenching true story presented with drama and passion by Opera Parallèle. Co-produced by SFJAZZ, whose DNA is in the broad idiom of jazz, the venue is remarkably fitting for this production with its thrust stage and steeply ascending seating creating the of a boxing arena that a proscenium arch could not match. The story is told in multiple flashbacks, opening with Griffith as an old man suffering from dementia pugilistica, a form of chronic traumatic encephalopathy. Arthur Woodley sings warmly as the doleful, disoriented man, repeatedly asking “where do my shoes go?” He is scheduled to meet Benny Paret, Jr., but he is too addled to grasp the difference between deceased father and living son. We are then removed in time and place to the island of St. Thomas and Emile Griffith’s youth. Kenneth Kellogg plays Emile with assurance from his teenage years and throughout his boxing career. He fits the role beautifully — a muscular man with a fine baritone voice. Griffith saw himself as a prospective singer and baseball player, but he also made women’s hats. On moving to New York, his oft-estranged mother tried to arrange a job with hat manufacturer, Howie Albert, who instead sees Griffith’s possibilities as a boxer. The highly respected Robert Orth plays the manufacturer become trainer. The rest, as they say, is history. “Champion” premiered at Opera Theatre of Saint Louis in 2013, and this is only its second production. Blanchard’s innovative opera deserves broader distribution. Heart rending history is portrayed in dramatic fashion, with quick pacing of scenes, supported by a rich score. Despite the subtitle “an Opera in Jazz,” the music seems largely postmodern, dissonant and of the same ilk as many contemporary operas. Jazz motifs may dominate, but eclectic influences are in evidence. Caribbean percussion and syncopation recur, and traces of gospel, Javanese, and pop-like strains make appearances. Given that Blanchard comes from an idiom of small ensembles, his use of a full orchestra is impressive — from sad cellos to grumbling trombones and harsh and unsettling full orchestration. Like much modern opera, “Champion” seemingly suffers from the notion that attractive, singable melody is passé. Indeed, much of the singing is recitative-like, to match a talky style that neither challenges the voice nor pleases the ear. And while repetitive lyrics from the old Griffith match his condition, elsewhere they seem a little lazy on the part of the lyricist. Several arias do enrich the score, as do ensemble pieces. “Far away and long ago” showcases Karen Slack’s powerful, soprano voice as Emile’s self-serving mother, Emelda. Her urgency rises when she emotes “you do what you gotta do…the sea ain’t got no back door” to justify her endless bad behavior. Although Orth’s lines are mostly chopped up in a manner expected of a boxing promoter, his “What’s the answer to that?” allows his expressiveness in fuller voice and with meaning. It speaks to the issue that “you can’t fit the truth in a three-inch column,” refering to newspaper reports. The truth is all the underreported contributing factors that led to Benny Paret’s demise, exonerating Griffith, whose psyche was damaged by the tragedy. Both singers playing the adult Griffith also receive turns allowing some strong vocal expression. Opera Parallèle’s artistic trajectory continues its ascendency with this production. Maestra Nicole Paiement leads orchestra and singers with precision. Director Brian Staufenbiel fills the simple set with motion and colorful costuming. Several scenes are visually dominated by the chorus, which is equally effective as brightly-dressed Islanders, ’70s gays in flowered prints, or press reporters in monochromatic suits and fedoras. Panels for projections are limited in size and could be better exploited, but newspaper clippings add both credibility and nostalgia. “Champion: an Opera in Jazz,” continues at SFJAZ through February 28. For further information, click here. “Champion: an Opera in Jazz,” by composer Terence Blanchard and lyricist Michael Christofer is produced by Opera Parallèle with SFJAZZ. Conductor: Nicole Paiement. Director: Brian Staufenbiel. Scenic Design: Dave Dunning. Lighting Design: Matthew Antaky. Media Design: David Murakami. Costume Design: Christine Crook. Wigs and Makeup Design: Jeana Parham. Choreography: Reginald Savage. Old Emile Griffith: Arthur Woodley. Young Emile Griffith: Kenneth Kellogg. Howie Albert: Robert Orth. Emelda Griffith: Karen Slack. Luis Griffith: Andres Ramirez. Kathy Hagan: Michelle Rice. Benny Paret, Sr. and Jr.: Victor Ryan Robertson. Cousin Blanche: Aisha Campbell. Little Emile: Moses Abrahamson. Sadie Donastrog Griffith: Chabrelle Williams. Man in Bar: Bradley Kynard. Ring Announcer: Mark Hernandez. 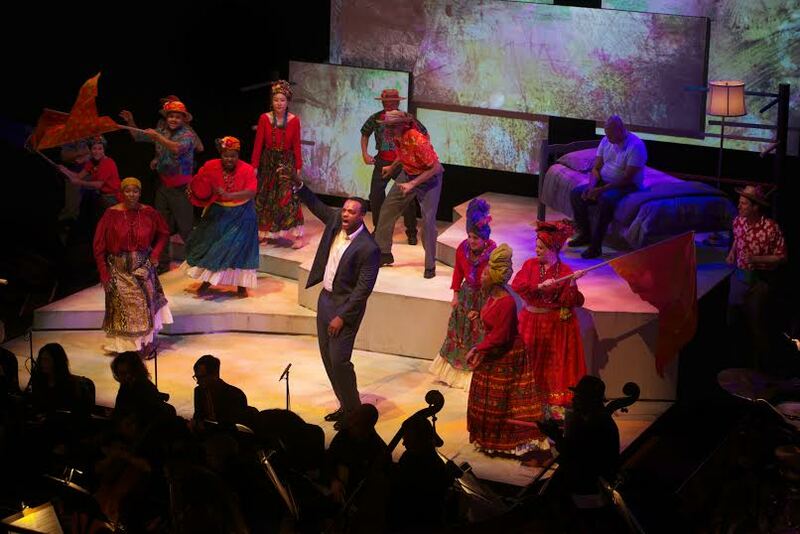 Posted in Reviews.Tagged Brian Staufenbiel, Champion: An Opera in Jazz, Charles Kruger, Michael Christofer, Nicole Paiement, Opera Parallèle, San Francisco bay area opera reviews, San Francisco bay area theater reviews, SFJAZZ, Terence Blanchard, theatrestorm, Victor Cordell.